Hair colour is the fasted growing segment in hair salon services. Over 60% of women colour-treat their hair, and the most common complaint is that hair colour fades too quickly! - Results in richer, longer lasting colour for up to 107% longer! * Deep conditioning treatment that heals traumatized hair. * Leave in or rinse out. Use as a weekly conditioner or daily. * Contains Color Attachment Technology to improve colour results. Use as a leave-in: Apply to towel-dried hair and leave-in for continuous healing action. Style as desired. 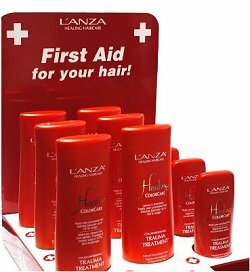 Use as often as needed to heal traumatized hair.